Finally, the dessert part of the evening is baked by a friend that I haven't met for months as he is no longer studying at my University. I'm very glad that he came to the cooking. He made date square which is almost like a crisp but there is an additional layer of oatmeal-based crust at the bottom of the filling. 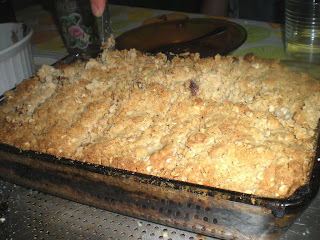 He got this recipe from Recettes du Québec, it is the Québec version of allrecipes.com. 2. In a medium saucepan, boil water over medium-high heat. 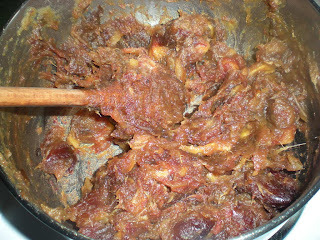 Add dates and cook until it has absorbed all the water and until softened. 3. In a large bowl, mix flour, sugar, oats and salt. Add butter into small pieces. 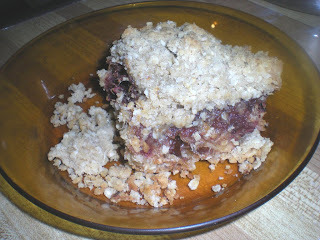 With pastry blender or two knives used scissor-fashion, cut in butter until mixture resembles coarse crumbs. 4. 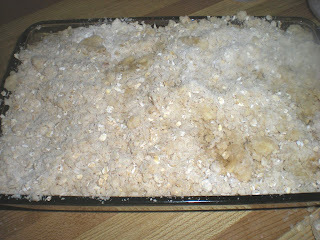 Spread half of the oats mix at the bottom of a 8 x 8 inch baking pan, lightly greased. 5. Cover with a layer of dates. Finish with the remaining of oats. 6. Bake for 30 minutes or until golden. Let it cool and cut into squares.